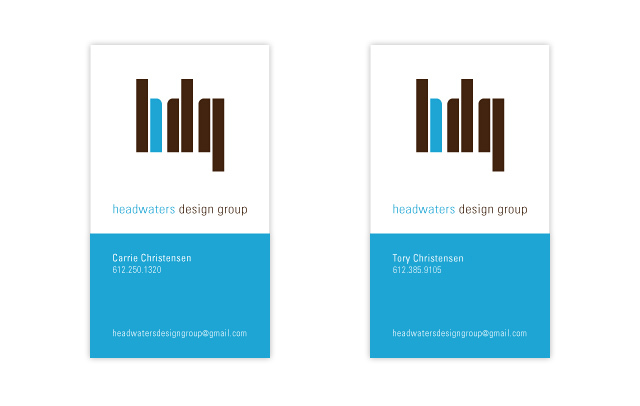 Headwaters Design Group - BrainstormOverload - Small design studio. Big ideas. HDG is a budding landscape architecture and prairie restoration business that is named for the headwaters of the Mississippi River where the principals first met. This logo represents layers of rock and the upwelling of water that form the letters h, d and g.
Business cards feature each owner’s name and contact information below the water line. Other options included visual references to the water table and rock strata and the layers of rock, water and plants wrapped around a sphere.